Though I am intrigued and inspired by all art media, I have an undeniable affinity toward painting, specifically Abstract Expressionism. 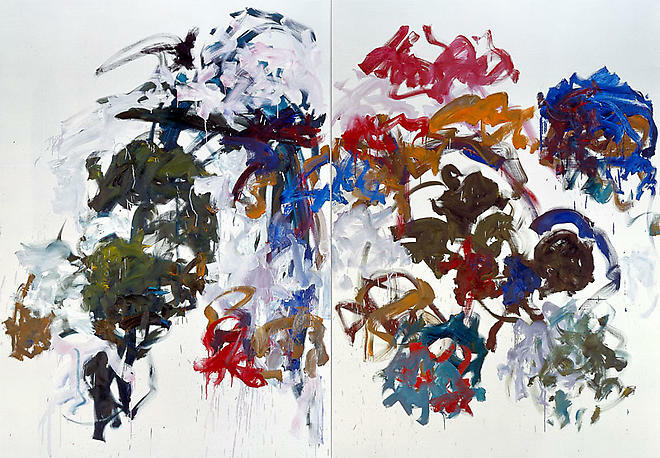 I've always been fascinated by the work of Joan Mitchell, one of few female artists (along with Helen Frankenthaler, Lee Krasner, and Grace Hartigan) whose work was recognized during an artistic period defined by male bravado. 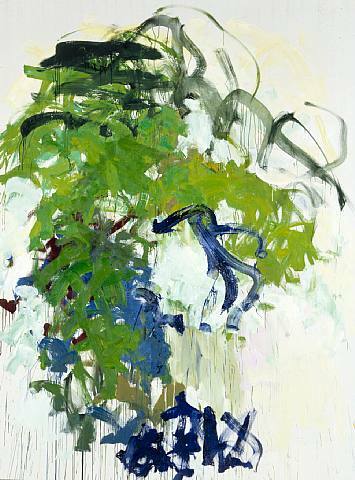 I developed a deep appreciation of her work during my undergraduate painting studies and an internship at the Joan Mitchell Foundation. The painterly print of these leggings immediately set me on course to yet another Mitchell-inspired outfit. As a young girl, Mitchell (1925-1992) excelled in figure skating. After an injury rendered her unfit to skate, she turned to painting as her mode of expression. Many critics have compared her visceral brushstrokes to the imprint of skates on the ice. 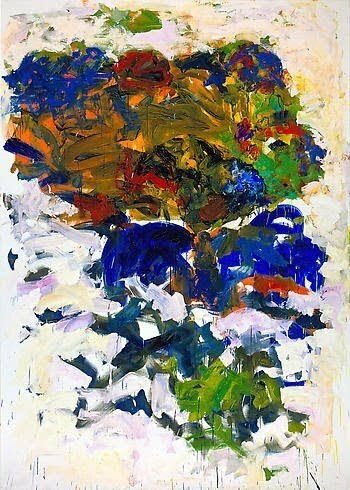 Though many Abstract Expressionist artists denied any kind of representation, Mitchell openly portrayed landscape through her large, colorful canvases. As a fixture at the Cedar Tavern, along with Willem de Kooning, Franz Kline, Mark Rothko, and Jackson Pollock, Mitchell was really at the core of Abstract Expressionism before she moved to Vétheuil, Monet's home, for the duration of her life. The Joan Mitchell Foundation now exists to support art education for underprivileged youths and provide teaching jobs and grants to working artists. Find out more about the Foundation and its programs here. To balance out the Mitchell-esque print of the leggings and tee, I simply added a few bright solids and neutral accessories. This Burton snowboarding under armor has to be the warmest, most versatile thing in my wardrobe. Though I do not participate in any winter sports, I can definitely appreciate a good warm layer in the winter months! I'm wearing an H&M sweater dress, Burton Dry Ride thermal leggings and crewneck, a vintage braided leather belt, AE scarf, Marc bag, and Zigi SoHo suede boots. Ahhh...my color inspiration : ) I LOVE THAT BLUE! The leggings and thermal are so funky! Love how you styled this (especially the addition of the green plaid scarf)! I love your leggings and the way you use colour! I am in love with that under armor! 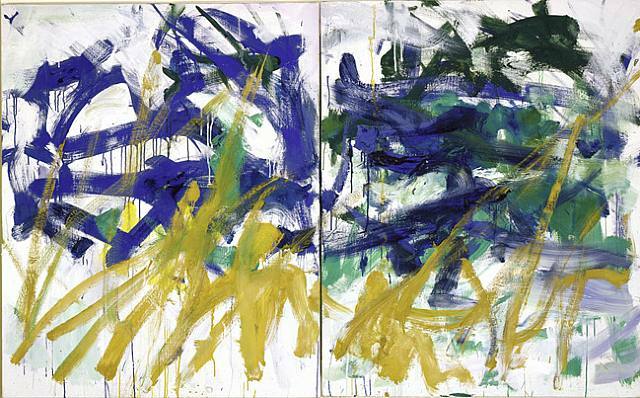 Abstract Expressionism is my favorite, too. I love Jackson Pollock. Oh these legging are to die for ! Wow, I love the painterly and plaid mix! Adding in the Abstract Expressionism made for a great post as well! Who knew thermals could be so flippin stylish? That print is TDF. So pretty. If I could go back in time - any time - I'd go back to the Cedar Tavern when they were all hanging out there, arguing and getting drunk. What an exciting time to be a part of, you know? I love the tights, and thermal they are so colorful. I bet they are really warm too. I love green, and blue together it's a nice break from all the black I'm seeing. Brilliant, Ariel. Thank you for introducing me to another painter whose work I did not know. The colors and dynamics in these prints are wonderful, I especially like the second. Your outfit complements these beautifully. Love the tights and the bright blue sweater, green purse, and the blue and green mixed together in the scarf. Sublime. Nice pictures in the woods too. This might be one of my favorite of your looks, Ariel. It's beautiful, with each piece perfect. I don't know how you do it--but I'm in awe. I love that you're able to make under armour fashionable! It looks great and you look warm, win win win for all! I just love this outfit. The matching leggings and top is so crazy but somehow you make it work brilliantly and it definitely resembles your inspiration. your leggings are beautiful ! I love the way you melt art and clothes, I'm very sensitive to that ! love your outfit posts because they bring such an artful eye to each look! i can definitely see the vision behind these. the leggings are perfectly inspired, and I love that you weren't afraid to layer bold color & print over them! I am ready to sprout some poetry when I saw you in this outfit! Gorgeous leggings, you brought the woods some life! I really like what you men are up too. this form of clever work and reporting! Hold up the best works guys I have protected you guys to blogroll. this is very interesting blog.Thanks for sharing such a nice blog.